Do you have photos, historical accounts or other items pertaining to the Center City area? Would you like to share this historical information with the world? LakesnWoods.com would like to publish your Center City photos (current or historical) or historical accounts on this website. Original materials can be returned and your privacy will be respected. 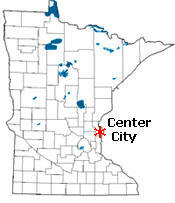 Center City is a city in Chisago County, Minnesota. 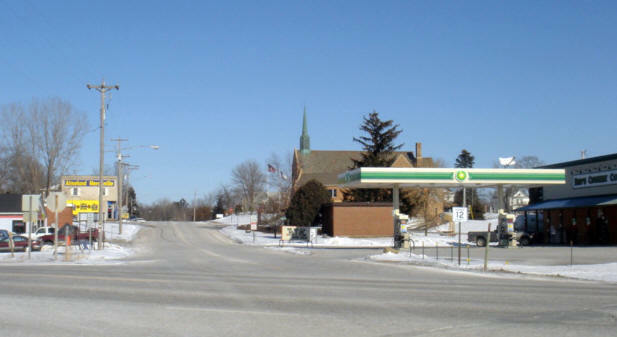 US Highway 8 serves as a main arterial route for the community. According to the United States Census Bureau, the city has a total area of 0.61 square miles (1.58 km²), of which, 0.59 square miles (1.53 km²) of it is land and 0.02 square miles (0.05²) km is water. The elevation is 928 ft (283 m) above sea level. As of the census of 2010, there were 628 people, 247 households, and 175 families residing in the city. The population density was 1,064.4 inhabitants per square mile (411.0/km2). There were 291 housing units at an average density of 493.2 per square mile (190.4/km2). The racial makeup of the city was 97.8% White, 0.5% African American, 0.6% Native American, 0.3% Asian, 0.2% from other races, and 0.6% from two or more races. Hispanic or Latino of any race were 1.1% of the population. There were 247 households of which 27.9% had children under the age of 18 living with them, 59.1% were married couples living together, 8.9% had a female householder with no husband present, 2.8% had a male householder with no wife present, and 29.1% were non-families. 26.3% of all households were made up of individuals and 10.5% had someone living alone who was 65 years of age or older. The average household size was 2.38 and the average family size was 2.81. The median age in the city was 44.7 years. 19.6% of residents were under the age of 18; 8.1% were between the ages of 18 and 24; 23.1% were from 25 to 44; 31.4% were from 45 to 64; and 17.8% were 65 years of age or older. The gender makeup of the city was 50.3% male and 49.7% female. CENTER CITY, a city in Chisago Lake Township, was platted in May 1857 and has been the county seat since 1875. 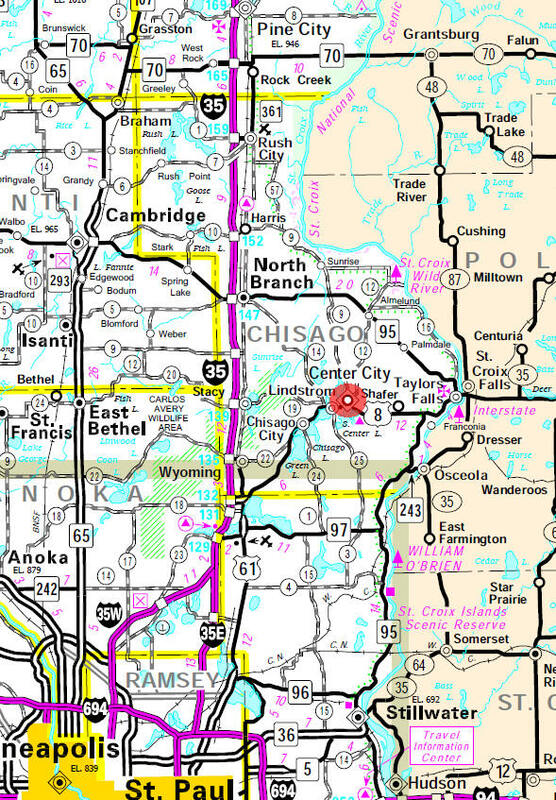 Its name refers to its central position between Chisago City and Taylors Falls. It is the state's oldest continuously inhabited Swedish settlement. 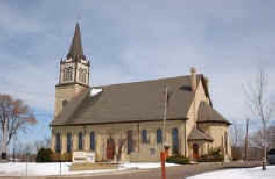 It was incorporated as a village on November 10, 1903, and separated from the township on March 16, 1915. 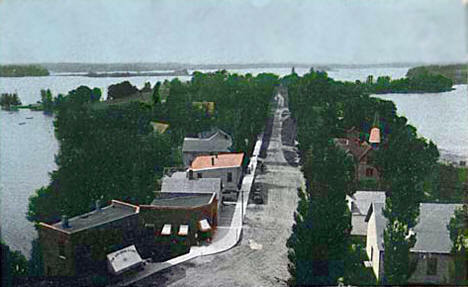 The first post office, located in section 26 about one mile east of the present city, was named Centre City, 1858-63, then Chisago Lake, 1863-77, and then again Centre City, until 1893 when the present spelling was established. Built in the early 1900s, the olde theatre building has seen many uses. The street level has had many types of business such as a grocery and merchantile store, diner, dentist office and flower shop in years past. 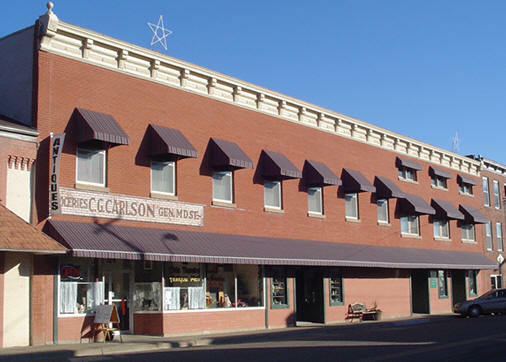 Currently the street level is home to an antique store while the theatre located on the second level and still in its original condition, is used for dance instruction and continues as a place for community events. 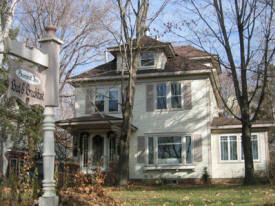 Plays, old time movies and estate auctions are among plans to be held here in the near future. 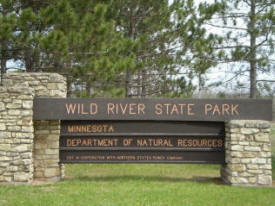 Wild River State Park is located along 18 miles of the beautiful St. Croix River. The park attracts people who enjoy camping, hiking, horseback riding, canoeing, interpretive programs, self-guided trails, and cross-country skiing. Day visitors can enjoy a leisurely paddle down the St. Croix River from the Sunrise river access to the southern park river access. 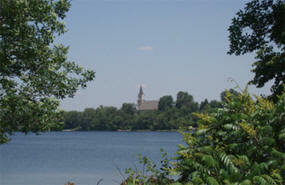 The park provides opportunities for semi-modern camping, group camping, backpack camping, canoe camping, and walk-in camping. Motel rooms with cable, refrigerator and microwave oven. Our Marina offers boat slip rentals. Other features include a picnic area and camp fire pit. 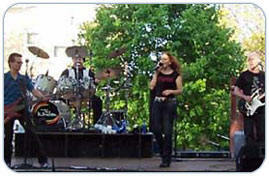 Al's Center Saloon is a rustic bar located just off Hwy 8 in Center City, MN. An amazing selection of scotch and various beers from around the World set Al's apart from any establishment in the area. With live music, pool and darts, a good time is hard to avoid – not to mention Al's fantastic pizza and the best burgers around. Situated on 500 private, peaceful and scenic acres of rural Minnesota countryside, Hazelden's Center City campus, located 50 miles north of Minneapolis and St. Paul, MN, is the largest facility in the Hazelden system. Each year more than 2,000 men and women begin their recovery journey here. 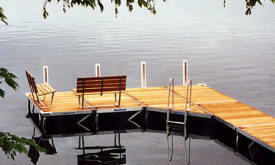 Pier Pleasure's dock system offers many features and benefits not found in any other dock system. These unique features make them simple to install, level and remove. For the past twenty plus years, entertainment buyers from across the country have relied on The Music Works to fill their entertainment needs. We work with multinational corporations as well as fairs, festivals, nightclubs, and every type of private function imaginable. Here at My Burger, we offer our customer fresh food with a simple approach. Our menu contains only essential items; no fluff, no fuss, no extras … just quality. We offer a fresh, quarter-pound, all beef burger with or without cheese, fresh fries, thick malts, and ice-cold soda, all in one size only. Panola Valley Gardens is a private garden, whose namesake is taken from nearby historic Panola Valley in Chisago County, Lindstrom, Minnesota. Our first garden wedding was performed on Aug. 31, 1996. Since then, Panola Valley Gardens has continued to grow year after year. 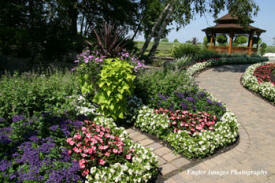 Our gardens are available spring, summer, and fall, for wedding ceremonies, receptions, and garden luncheons. Pioneer Search Inc. is a Minnesota corporation providing financial business consulting services to the non-profit business community in the greater Minneapolis and St. Paul area. 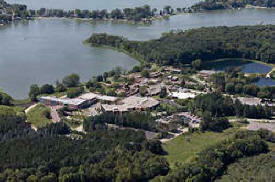 High above the sparkling waters of Ki-chi-saga (North Center Lake) sits the Summit Inn, a unique combination of tranquility and history. Once the home of lawyers and physicians, (in a community immortalized through the epic works Vilhelm Moberg, creator of the mythical Swedish immigrants, Karl Oskar and Kristina) the Summit Inn is listed on the National Register of Historic Places. Stroll through our English country gardens. Systems Management & Balancing of Minnesota is an independent HVAC Test & Balance agency headquartered in Center City, Minnesota. 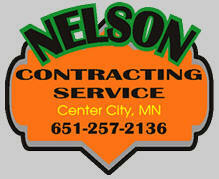 Systems Management & Balancing has been in Minnesota since 1968. We are a certified member of the Associated Air Balance Council (AABC). Wild River Stable is located in the scenic St. Croix River Valley near Taylors Falls, Minnesota, next to Wild River State Park. We offer boarding with an indoor and outdoor arena, and access to 22 miles of Wild River State Park trails. We also offer private riding lessons, day camps, and group lessons.